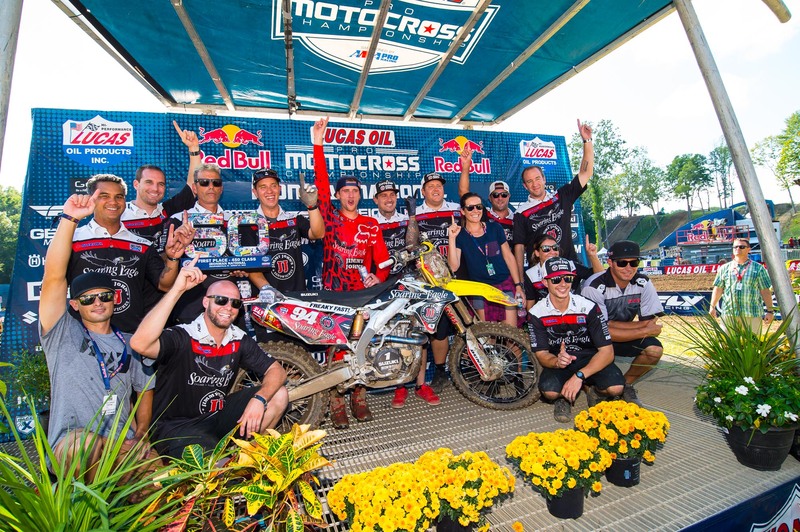 Ken Roczen certainly didn’t have anything left to prove as the Lucas Oil Pro Motocross Championship headed to Ironman Raceway in Crawfordsville, Indiana, for the 2016 season finale. He’d already clinched a second 450 championship. He’d already won 18 (of 22) motos. He’d already had eight 1-1 performances. He’d already led 294 laps. He’d… well, he’d done it all. Yet, there was Roczen, up front both motos, racing to a ninth 1-1 day. What motivated him? It turns out, motivation was a little hard to come by this week. Roczen will now go into real vacation mode, as his next scheduled race isn’t until the Monster Energy Cup in October. Most signs point to Roczen being with Honda HRC at that time, but when asked if this was his last race with Suzuki, Roczen just said he would be at the Monster Energy Cup. AutoTrader.com/Monster Energy/JGR Yamaha’s Justin Barcia had arguably his most impressive afternoon of the season. He kept Roczen honest for a number of laps in the first moto and cruised to second. In the second moto, he built a nineteen second lead over Eli Tomac only to see it nearly wash away late in the race after he went down in a corner. After getting his bike restarted, Barcia regrouped, and built a six second lead on Tomac at the end. What’s been the difference lately for BamBam? Barcia ended the season strong going 3-3-2-2 over the last four rounds. He will for sure race the Charlotte GP next weekend but said he wasn’t sure about the GP at Glen Helen. We’ll have more with Barcia early next week about his season, the Motocross of Nations and more. As for Tomac, he was certainly fast all day, but starts held him back again. He was sixth after the first lap in both motos, which isn’t terrible, but when Roczen is up front it’s hard to make up that much ground. He made two incredible charges in both motos to get Marvin Musquin for third and finished the day third overall. Musquin ended the season with a 4-4 day, which was easily good enough to clinch third in points. 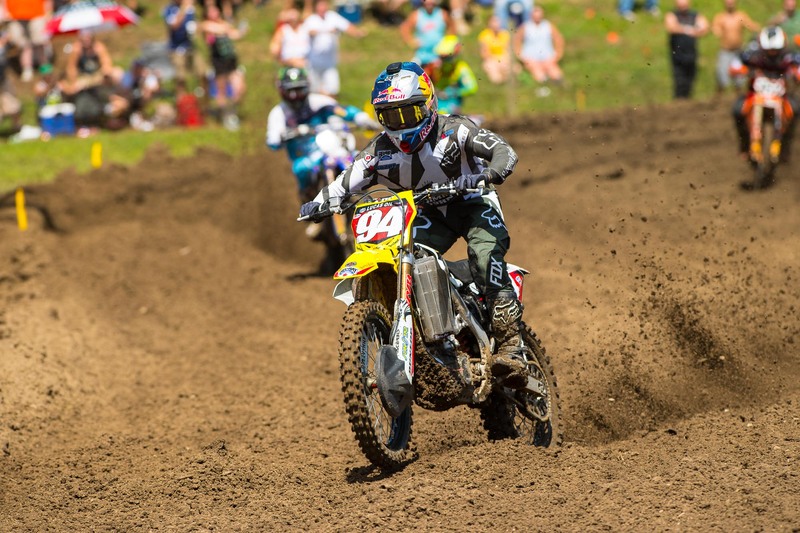 The 450 rookie bested Barcia by 41 points. Jason Anderson was back in action for the first time since High Point due to a collarbone injury. Anderson will represent the United States at the Motocross of Nations later this year and needed some gate time. Anderson didn’t miss much of a beat, going 5-5 for fifth overall. We’re sure Steve Matthes will go on and on and on and on all week about Canadian Kaven Benoit. But it’s actually well-deserved. Benoit finished eleventh overall in his first Lucas Oil Pro Motocross action of the year. We'll have more on Andrew Short's last race of his career today, but it was damn cool seeing him pull the holeshot in the second moto before a mechanical took him out of the race. 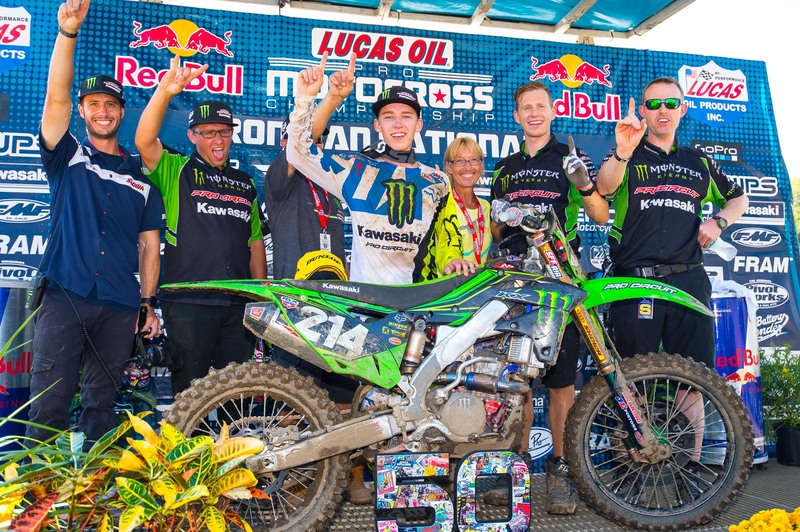 Austin Forkner ended a brilliant rookie campaign the best way possible—winning his first career overall. The Missouri native finished fourth overall in points, won two motos and captured an additional five moto podiums. Oh, and he led 52 laps on the season, fourth most in the class behind only Cooper Webb, Alex Martin and Joey Savatgy. Forkner has showed poise well beyond his years all season, and incredible consistency for a rookie. He finished outside the top ten in just three motos and averaged a 6.4 finish through 24 motos. There is something about the state of Indiana and Aaron Plessinger. Last year, he collected his first career moto win—and overall—at Ironman. Earlier this year, he won his first career supercross in Indianapolis, and today, he won a moto for the first time since Ironman last year. The win was a bit surprising, considering Plessinger struggled to an eighth in the first moto. But he said he found the right mindset going into the second moto, which helped. There wasn’t much for Cooper Webb to fight for today. He’d already clinched the 250 title a round early last week at Budds Creek. It didn’t stop him from charging back from three crashes on the day (two in moto one, one in moto two) to capture third overall on the day. The Star Racing Yamaha trio of Plessinger, Webb and Alex Martin actually tied on points (38) for second behind Forkner, with Martin catching the short-end with a fourth in the second moto (the worst of the group). Mitchell Harrison made it four Star riders in the top seven, behind a seasons-best sixth in moto two. For the third time in the last three races, former points leader Joey Savatgy wasn’t able to finish the second moto. 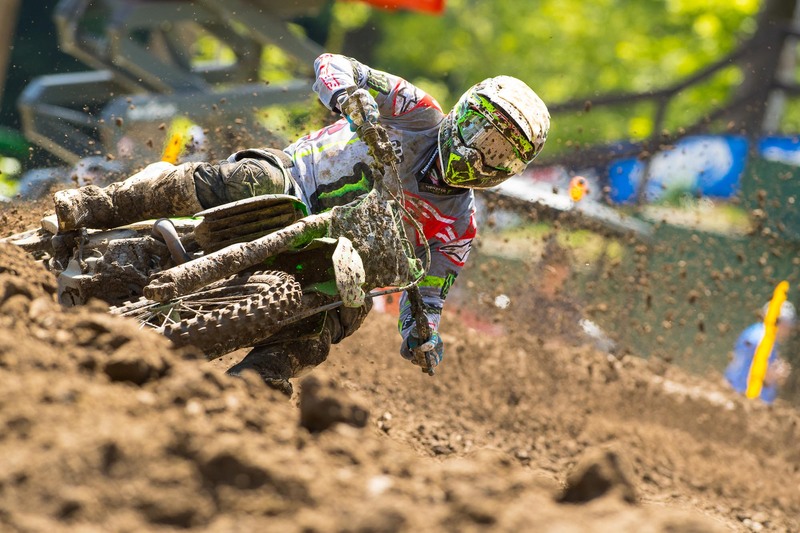 Since Unadilla, Savatgy has gone 2-3-2 in the first motos, and 32-34-34 in the second motos. Despite the late slide, Savatgy still held on for third in points, just seven clear of his rookie teammate. Adam Cianciarulo has certainly had his share of troubles in his short pro career. A bout with salmonella, shoulder injuries and a wrist injury have limited him to just 32 of 77 scheduled races (or 41.5 percent) in his SX and MX career. Today, he completed the first full series in his pro career. He finished fifth overall on the day and captured eighth in points. Andrew Short pulled the holeshot in his final career moto, dropped the mic and walked away into the sunset. Actually, he had a problem with his rear shock and had to pull off after the first lap. Still, we should remember Shorty for pulling a holeshot in his final moto, not a mechanical. Up front it was a repeat of the first moto with Ken Roczen taking the early lead over Justin Barcia. This time, Roczen built an early lead—nearly 11 seconds by lap 5—and ran away to clinch another 1-1 afternoon on the 2016 season. Barcia saw a near nineteen second gap over Eli Tomac slip away late in the race when he went down in a corner. Eventually he was able to get the bike restarted before Tomac erased the entire lead, but he still had Tomac on his tail. In arguably his best ride of the season, Barcia turned it back up and held Tomac off by six seconds. Marvin Musquin took third ahead of Jason Anderson, Matt Bisceglia, Weston Peick, Phil Nicoletti, Fredrik Noren and Kaven Benoit. The real battle of the moto was for third between Marvin Musquin and Eli Tomac. Musquin held the spot for the opening seven laps before Tomac used a huge scrub up the hill to put the pressure on Musquin and soon took over the position. Tomac made things interesting when he went down a few laps later. Musquin retook third until two laps to go when Tomac once again charged back and passed the Red Bull KTM rider. This time he wouldn’t relinquish the spot. Barcia was never challenged for second and finished 6.1 seconds behind Roczen. Jason Anderson, Phil Nicoletti, Benny Bloss, Weston Peick, Fredrik Noren and Dean Wilson rounded out the top ten. - In his first Lucas Oil Pro Motocross race of 2016, Canadian Kaven Benoit finished an impressive twelfth. - Andrew Short, in his second-to-last career moto, finished thirteenth. - Now a full-time GNCC racer, Ryan Sipes, in his first appearance on the circuit this year, finished nineteenth. Austin Forkner is legit, folks. If you didn’t already know that after the rookie season the Monster Energy/Pro Circuit Kawasaki rider has already had, then the first moto at Ironman certainly changed your view. Forkner grabbed the holeshot in the first moto, on a track that is still a bit “soupy” after rain leading up to the event, and, really, the race was over from there. Forkner built an eight second lead by lap 3 and turned it into 15.2 by lap 5 and 28 seconds by checkers. Impressive riding from the rookie, who notched the second moto win of his young career. If anyone was going to challenge Forkner it was going to be Cooper Webb, and early on, the title winner was in great position to do so. But he stalled his bike in a corner and fell outside the top ten. He would come back to grab fourth late in the race, but he went down hard with a few laps to go while challenging Alex Martin for third. He would finish fifth. Joey Savatgy finished second in front of Martin, Arnaud Tonus, Webb, Adam Cianciarulo and Mitchell Oldenburg. - Conditions seemed like a perfect match for last year’s Ironman winner Aaron Plessinger, but the Yamalube/Star Racing rider could never get anything going and finished eighth. - RJ Hampshire, who had to qualify out of the LCQ, finished fourteenth. - After setting the third fastest time in qualifying, Canadian Dylan Wright finished twenty-first. - Chris Alldredge also qualified out of the LCQ. He finished eighteenth. The 2016 Lucas Oil Pro Motocross Championship has ended for the 250 Class, but it certainly left us plenty to talk about. Monster Energy/Pro Circuit Kawasaki’s Austin Forkner took the holeshot in the second moto over Yamalube/Star Racing Yamaha teammates Cooper Webb and Alex Martin. The moto one winner wasn’t able to run away from the field like he did in the first moto, but he looked solid for a number of laps as Plessinger applied a ton of pressure. 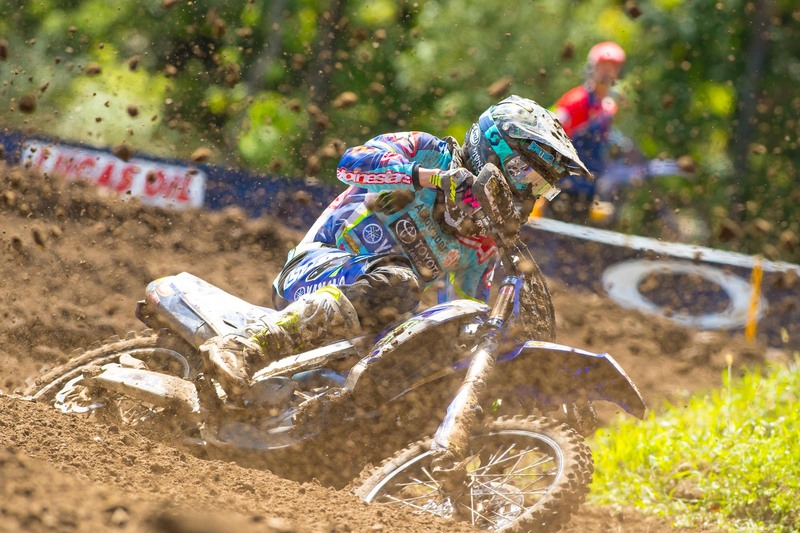 Plessinger again pulled close as the two crossed the finish line for the ninth lap. But Forkner wouldn’t lead another lap. In the same spot he made a mistake in the first moto that forced him off the track, Forkner went down again, tossing away the lead. He was able to regroup and get up in second, but a lap later he lost that spot to Webb. There was still reason to celebrate if you’re Forkner. With a third place finish he clinched his first career overall win in Lucas Oil Pro Motocross. After getting the lead, Plessinger ran away to win his second career moto—first since Ironman last year—behind a more than twelve second lead. Webb finished second ahead of Forkner, Alex Martin and Adam Cianciarulo. Mitchell Harrison made it four Star Racing riders in the top six, ahead of Martin Davalos, Justin Hill, Arnaud Tonus, who came back from an early crash, and RJ Hampshire. - Not sure what happened to Zach Osborne, but he was 38th after the first lap. He came back to finish 16th. We’ll provide an update as more information is known. 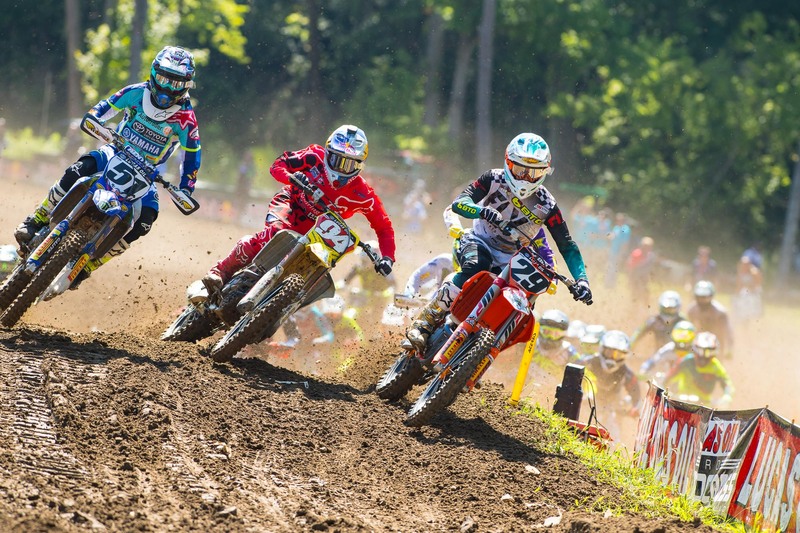 Ironman Raceway in Crawfordsville, Indiana, will serve as the final round of the Lucas Oil Pro Motocross Championship. While the facility is new on the Pro Motocross circuit (today will be the third race ever held here) it’s well known in GNCC circles, hosting a round since 1995. The facility sits on The Shaver Family Farm and it’s been estimated that 3,000 truckloads of organic material mix and sand were used in order to build the facility, which hosted its first Pro Motocross event in 2014. As Jason Thomas pointed out in his Staging Area column, we may see similar conditions as 2015, due to heavy rains that have been in the area all week. It has rained briefly this morning as well, but rain is expected to hold off this afternoon. Luckily for Ken Roczen and Cooper Webb, the weather will have zero affect on their title chances, as both clinched a round early last weekend at Budds Creek. Roczen caused a stir earlier this week, posting on Instagram that he wanted to RM 250 this weekend. Unfortunately, that won’t happen due to AMA rules. DC explained why in Racerhead. Although both titles have been wrapped up, there is still plenty to watch for this weekend—starting with Andrew Short. Today will mark the final race in the professional career of Short, which started way back in 2000. Short made his pro debut more than fifteen years ago at Steel City Raceway, and has signified what it means to be a professional throughout his career. I think I speak for everyone in saying, damn fine career, Shorty! Benny Bloss is looking to secure fifth in points. The rookie trails the idle Christophe Pourcel by thirteen, but has company, as Phil Nicoletti is only three back. Tenth in 250MX will be a tight battle as well, as Mitchell Oldenburg (ninth) enters with a two-point lead over Arnaud Tonus (tenth) with RJ Hampshire (eleventh) looking to break into the top ten. Hampshire trails Oldenburg by thirteen and Tonus by eleven entering the weekend. Fantasy Alert: Jason Anderson is back for the first time since High Point due to a broken collarbone. Ryan Sipes, now a full-time GNCC racer, is racing the 450 Class today.